A Super Bowl party has got to have fabulous food. Even though a typical menu has an indulgent reputation, healthy Super Bowl party food ideas do exist, this roundup proves it! Check out these suggestions for all sorts of great eats for a football themed party: watermelon helmet, sausage and cheddar football bites, deviled egg footballs, turkey avocado onigiri footballs, soft pretzel footballs, chocolate covered apple and strawberry footballs, touchdown popcorn, cheese football, pizza and fruit pizza. Yum! Keep the fun going throughout the big game with these 14 Games to Play at Your Super Bowl Party. This watermelon is perfect for super bowl Sunday! The awesome and easy helmet shaped watermelon is a great way to convince your kids to get some healthy food in during the big game. I like to serve this with an a sweet dip as a dessert! The instructions are very clear so you’ll be able to easily add this to your snack table. Fill it with fruit of your choice, and you’ll be set for game day! These football bites are ready in just 10 minutes! The football shapes are easily created with the edges of a can and the stitches are created with piped ranch dressing. Using a darker colored sausage will help these to resemble a football even more! What a great idea for game day! These adorable onigiri footballs are made using turkey, avocado, rice, and nori! They make the perfect healthy addition to your Super Bowl party. The stitching on the footballs are made using strips of nori (seaweed). For this recipe, you will need a football-shaped cookie cutter. The avocado is mixed with lime juice to create a fresh and delicious spread that holds the whole thing together! Devilled Eggs are always a fan favorite. These football-shaped devilled eggs will bring your football game to the next level! You can pre-boil the eggs and just put everything together on the big day to save some time. The stitching is made on these by using pieces of cut up chives, which also serve as a colorful garnish to these delicious appetizers! I can never pass up the opportunity to have a fresh-baked soft pretzel. They make the perfect bar food, and game day food! These soft pretzels are shaped like footballs to really make your game day festivities fun. Serve them with some mustard, or aioli and you’re all ready for the big game! Everyone loves pizza, and this one is so easy to make! Use your toppings to create fun things like goalposts, football fields, and even game play plans! Use pepperoni for footballs, and peppers to create “x’s” and olives for “o’s”! Olives also make for a great goalpost! My kids loved designing their pizzas before I popped them into the oven. Getting your kids to eat healthier during gameday has never been easier! These apples are coated in dark chocolate and decorated with white icing to create awesome little footballs! Soaking the apples in pineapple juice before you coat them will help to prevent your apples from browning while adding some sweetness to them! If your chocolate becomes too thick while coating, add some oil or shortening to it to keep it the right consistency! Chocolate Covered Strawberries aren’t just reserved for romantic date nights. These are beautifully made for game day! Strawberries already have almost the perfect shape to make footballs! Create the stitching using piped icing, or if you’re adventuros, you could even use strips of fondant! Chances are, you’ll be watching the game on a TV this year. Popcorn is the best snack food while you’re watching the big game! These printables are the perfect touch(down) for your popcorn buckets! They feature an awesome football field with your 10 yard lines along the way. Add some flavoring to your different popcorn jars so that there is something for everyone! Whether you are hosting a super bowl party or a football themed party for kids, this cheese plate is the perfect touch! It is created with various ham, cheese, and cracker pieces that are arranged into a giant football. You can customize the meat, cheese, and crackers to suit the party you are making it for! Use white cheese strips to recreate the bands and stitches on the football. This delicious fruit pizza is made using a sugar cookie crust, cream cheese, and colorful fresh fruit! Pizza isn’t usually thought of as a desert food, but this will seriously change your outlook on pizza. Decorating it is fun to do with kids too! Set out the fruits and let them create fun football designs on their pizzas! This cheeseball is such a cool idea! Cheeseballs are always a staple at parties. This one is shaped like a football then rolled in chopped nuts to give it the same coloring! The stitching is achieved by adding roasted red peppers to the finished cheese ball. Serve it with your favorite crackers or even pieces of bread! I love making cheese balls because they can be made ahead of time and brought out right before serving. This also makes them perfect for bringing to a super bowl party if you aren’t hosting it! 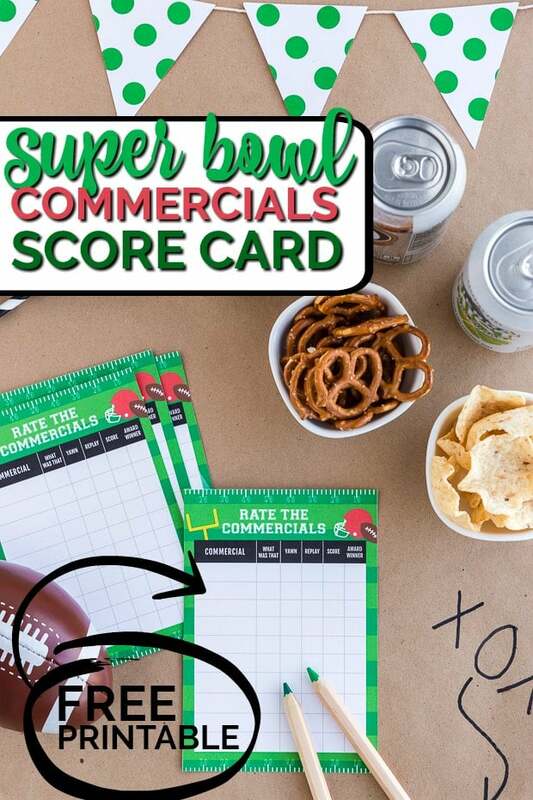 Plan the ultimate super bowl party with these sources gathered by the team at Spaceships and Laser Beams. Check out more fun super ideas perfect for game day.